You could say “Oh, not another burger joint”. But if you love burgers and quality fast food, you will be happy to know that Burgeraj is one of three burger joints in the very center of Zagreb (besides Papa’s and Rocket burger). This simple, hipster style decorated burger joint is situated in Preradovićeva street, conveniently across the street from a very hip club Alcatraz. So when you feel the urge to ease your hunger, a great place is just across the street. Burgers are juicy and tasty and you can choose one of the options – regular burger for 35 kn or triple burger for 47 kn. The difference is in the meat quantity in the bun. Although the buns could be a little bigger (if you are hungry, one burger won’t be enough), there is quite a good selection of 5 different sides, of which my favorite is caramelized onion and pepper jam. 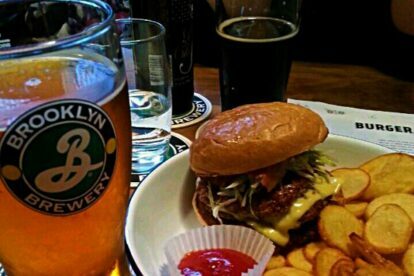 This is the only place in town where you can enjoy draft Brooklyn lager along with a few other American IPA’s (India Pale Ale). Although you can get the impression that burgers here are more expensive compared to other burger joints, if you look more closely you will see that you get a whole menu for that price – burger, fries and ketchup. So, visit this place and enjoy the burgers in a slightly different yet delicious way, as I do.